a first class FAMILY GROCERY. &c. BAGGING AND TIES always on hand at low figures. hich this boy started his fortune still stood on the Dowling farm west of Pinckard. "H.H." 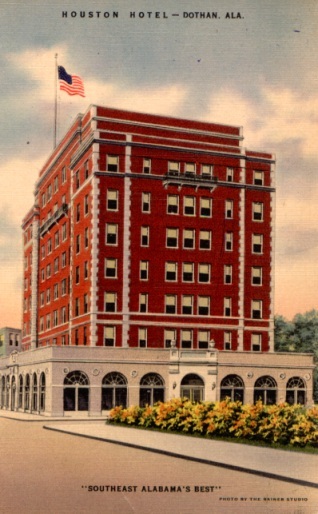 as he was known became the first millionaire to descend from ancestor Robert Dowling, ...Yet one of his first endeavors had been the job of "butch" boy on his hometown's railroad, selling onion plants, seed, newspapers, etc.” Eventually, Hayward Hart came into the possession of the Houston Hotel in Dothan, Alabama. (After Noel Dowling's death, Robert Ramsey, attorney and developer, bought out several of the heirs and held the controlling interest in the Hotel. Hilda Ramsey ran the restaurant which was famous for its delicious shrimp salad and mile high lemon meringue pie. The elegant ballroom became one of the favorite places for folks to go eat after church on Sundays. I remember attending a cotillion ball in the ballroom after my ballroom dancing classes. My mother-in-law, Hilda Ramsey, did a beautiful after rehearsal party for my husband (her son) and me in the ballroom.) The ballroom is now the set for WTVY news. Noel Baxter Dowling built a home in Dothan, Alabama, at 401 North Alice Street, which eventually became the home of his daughter Cora Lee Dowling and her husband, Richard Hawthorne Ramsey. Richard Hawthorne Ramsey came to Pinckard for work on the Midland Railroad. 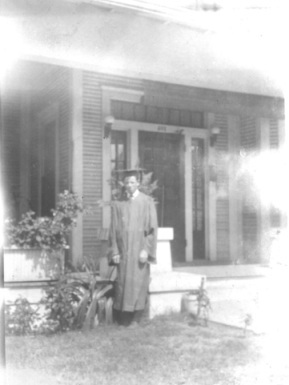 His father, David Wardlaw Ramsey was a veteran of the Civil War who trained at Tulane University as a doctor after the War and then became a Baptist minister. The church at which he preached was on the property that was once part of a large plantation owned by Joseph Richard Hawthorne, his wife’s father. David Wardlaw Ramsey’s father, Abiezer Clark Ramsey, had been a Methodist circuit rider before marrying Elizabeth Amanda Wardlaw Bonham, the widow of Simon Bonham, planter and lawyer who moved his family from Abbeville, South Carolina, to Wilcox County, Alabama. Soon after Simon Bonham died, Elizabeth Amanda Wardlaw’s brother-in-law was killed with his friend Travis at the Alamo. 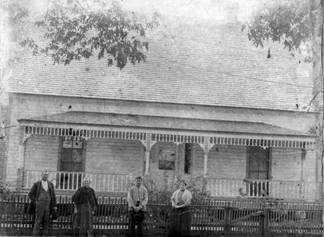 Cora and Richard Hawthorne Ramsey raised their four children, Richard Hayward, Joseph Robert, Cassie and Francis, in this house (above right). Their son, Robert Ramsey remembered driving the cow from his parent’s house in the 400 block of North Alice Street to his grandparent’s farm in Pinckard (below). The home on N. Alice is now Mildred's Restaurant. This is the Pinckard, Dale County, country home for Noel Baxter Dowling. Beat eggs to a stiff froth. Add cream of tartar and sugar. Continuing the beating.. Then fold in flour, salt and vanilla. Bake in unbuttered Angel cake pan 30 to 35 minutes. Test with broom straw. If it doesn't stick it's done. Cora’s daughter, Cassie (left below), passed this recipe on to Carrow’s grandson, Teri Towe, Princeton and University of Virginia Law School graduate and now attorney in New York. 1. FRAMPTON1 DOWLING was born Abt. 1600 in in Tyrone County, Ireland. Arrived in America Abt August 1643 from Ireland. [wiseIIIr1.FTW][E Dowling.FTW] According to the book, "Early Virginia Immigrants" pg. 97, there lists an Fr. Dowling who came in 1643 b y way of a ship whose Captain was Samuel Mathews, Esq. All records that can be found indicate this is the same Frampton Dowling. According to the book, "Dowling's of the South" by R. A . Dowling, too, list that on August 1, 1643 a FRAMPTON Dowling arrived in Virginia on board Captain Samuel Matthews ship. It is not known whether he was the father of a Corporal WILLIAM Dowling mentioned in Maryland records of 1694 nor whether he was kin to the Robert Dowling referred to in the Augusta County records of Virginia in1700.What is known, however, that in Virginia about 1730, a small DOWLING was born and given the name of ROBERT. Had he died without issue, DOWLING-blooded person mentioned in this book would have ever lived. For he was the Father of this Dowling Family - a family that has more descendants in the South than any other by the name Dowling. |      +Martha Stokes b. 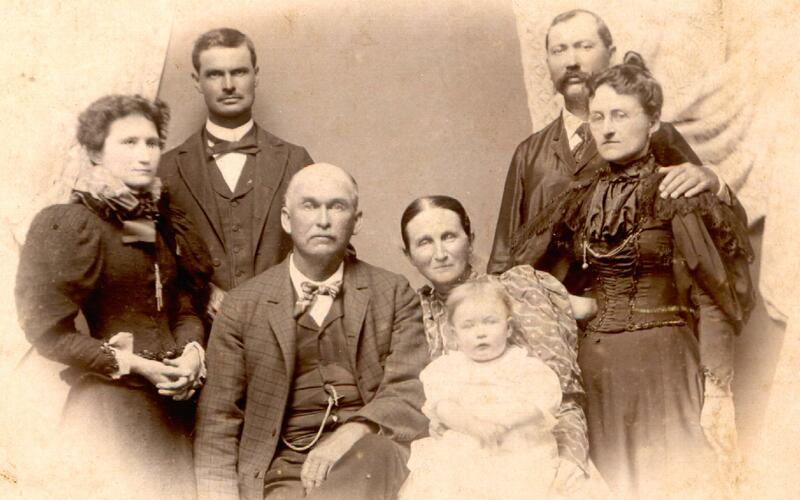 4 Mar 1787, Edgecomb County, North Carolina, m.
|     |--6-Wesley Dowling b. 1806, Jeffries Creek, South Carolina, d.
|     |  |  |  |--9-Arch L. Watson Jr.
|     |  |    bur. Union Cemetery, north of Slocomb, Alabama, par. 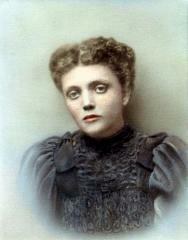 |     |  |   +Margaret Kelly m. 22 Jan 1874, d. 16 Aug 1887, par. W. F.
|     |      +John Jefferson Bottoms b. 29 Mar 1847, m. 18 Feb 1869, d.
|     |--6-Martha Dowling b. 1816, Jeffries Creek, South Carolina, d.
|     |   +Charlotte Brackin b. 20 Sep 1828, Alabama, m. 10 Jan 1841, d.
|     |    20 Oct 1888, Dale County, Alabama  Claybank Cemetery, par. |     |  |     |   +William Palmer Dr.
|     |  |   +Tansy J. Britt b. 20 Mar 1838, Randolph County, Georgia, d.
|     |     |  |  |--10-L. Ennis Gibbons Jr.
|     |     |   +Charles D. Murphy , Sr.
|     |     |--8-Cora Lee Dowling b. 1877, Ozark, AL Dale County, d.
|     |     |    Wilcox, m. Jun 1966, d. Dothan, AL., City Cemetery, par. |     |     |  |--9-Cassie Ramsey b. 14 Mar 1899, Pinckard, Alabama, d.
|     |     |  |  |--10-Richard Hawthorne Ramsey b. 11 Jun, Dothan, AL. |     |     |  |  |    m. 1963, Dothan, AL. |     |     |  |  |--10-Jon Allan Ramsey b. 25 Sep 1939, Dothan, AL. |     |     |  |      +Luana Granger b. 16 Mar, Marianna, Florida, par. |     |     |     |   +Pamela Thuss b. 1950, Birmingham, Alabama, m.
|     |     |     |  |    Merced, California, m. 5 May 2001, 17807 Hwy. |     |     |         +Joyce Walker b. 1947, Fayetteville, Georgia, m.
|     |     |          Methodist Church, Fayetteville, GA.
|     |  |   +John C. Holman Sr.
|     |  |  |  |--9-Robert Edward Holman Jr.
|     |  |  |--8-Dr. Henderson Looney Holman . |     |  |     |--9-Henderson "H. L." Holman Jr.
|     |--6-Mary Anna Dowling b. 1824, Jeffries Creek, South Carolina, d.
|     |  |     |--9-Oscar Spear Jr.
2. i. ROBERT2 DOWLING , AMERICAN REVOLUTION, b. Abt. 1730. 2. ROBERT2 DOWLING , AMERICAN REVOLUTION (FRAMPTON1) was born Abt. 1730. He married SARAH GUINN 1754, daughter of JOHN GUINN and SARAH HARPER. 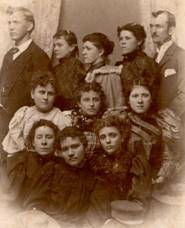 You will notice Carrow (bottom row) and Cora in this group of young people. The name Guinn goes back to Wales to the Gwydir Castle. The names of Gwin, Gwinn, Gwyn, Gwynn , Gwynne, Guin, Guinn, Wynn, Wynne are all derivitates of the original name of Gwynedd. The earliest known "Gwin" who came to America was Capt. Owin Gwynn, Esq. son of Sir John Wynn of the Wynn family of the Gwydir Castle, Wales in 1611. His son Col. Hugh Gwynne was the first to permanently settle in the US. (Owin returned to Gwydir Castle when his father died to succeed to the baronetcy.) Source: "History of the Gwin Family", by Jesse Blaine Gwin, Fairfax, Va . 1961.
i. WILLIAM3 DOWLING, m. REBECCA WALKER. 3. ii. JAMES DOWLING , AMERICAN REVOLUTION. iii. STEWART DOWLING, m. MARY AN. iv. ELIZABETH DOWLING, m. OGLEBEE. v. SARAH DOWLING, m. FREDERICH LEE. 4. vi. JOHN DOWLING , AMERICAN REVOLUTION, b. 1759, Virginia; d. 1826, Jeffries Creek, S.C. fought with Frances Marion. 3. JAMES3 DOWLING , AMERICAN REVOLUTION (ROBERT2, FRAMPTON1). He married MARY BOUTWELL, daughter of BURTONHEAD BOUTWELL and ELIZABETH COMMANDER. 4. JOHN3 DOWLING , AMERICAN REVOLUTION (ROBERT2, FRAMPTON1) was born 1759 in Virginia, and died 1826 in Jeffries Creek, S.C. fought with Frances Marion. He married NANCY BOUTWELL 1783, daughter of BURTONHEAD BOUTWELL and ELIZABETH COMMANDER. 1 AGNC Guerilla with "Swamp Fox" Francis Marion with brother James and father. BURIAL: first buried in the Zion Methodist Cemetery in Dale Co., AL, then to the Ebenezer-Zion Cemetery in Dale Co., AL and has now been moved to the Claybank Cemetery in Ozark, Dale Co. , AL. i. ELIAS4 DOWLING, m. (1) MARY; m. (2) ELIZABETH STEWART. ii. LYDIA ANN DOWLING, m. JOHN STOKES. iii. ZACHEUS DOWLING, m. (1) ELIZA; m. (2) ZADIE CAPP; m. (3) PERMELIA HEAD. iv. ALLEN DOWLING, m. POLLY HEATH. v. RHODA DOWLING, m. HENRY STOKES. vii. LEVI DOWLING, m. ANN. viii. JEMIMA DOWLING, m. BENJAMIN HILDRETH. 5. ix. DEMPSEY DOWLING , REV. AMERICAN REVOLUTION, b. December 14, 1783, Jeffries Creek, Darlington District, SC; d. April 28, 1865, Claybank Cemetery, Dale County, Alabama. 5. DEMPSEY4 DOWLING , REV. AMERICAN REVOLUTION (JOHN3, ROBERT2, FRAMPTON1) was born December 14, 1783 in Jeffries Creek, Darlington District, SC, and died April 28, 1865 in Claybank Cemetery, Dale County, Alabama. He married MARTHA STOKES, daughter of JOHN STOKES and NANCY VICKERS. 1 AUTH when died proclaimed, Glory, Glory, My room is filled with a heavenly light. The day before she died she appeared to be in better health than usual. After eating a hearty supper she and Dempsey and a few of the grandchildren joined in family prayer. A short time after retiring, she aroused her companion by giving signs of the arm, and a few minutes after, she sank in the arms of death. As she went she shouted, "Glory,glory", and told those present that she would soon be in heaven; that "myroom is full of heavenly light." She was an affectionate mother, a dutiful and kind wife, a generous mistress. She raise d fourteen children of whom two are Methodist preachers. At her burial there were 108 of her descendants present. i. MILLIE (TW)5 DOWLING, m. WILLIAM COX. iii. LACY DOWLING, m. ELISHA MATTHEWS. iv. NOEL DOWLING, m. SARAH D. MCDONALD. v. FLETCHER DOWLING, m. CAROLINE MARTIN. vi. ZILLIH DOWLING, m. SAMUEL H. HALLFORD. vii. MARTHA DOWLING, m. EMMANUEL PARRISH. 6. viii. JOHN DOWLING, b. July 29, 1818, Jeffries Creek, S.C.; d. February 28, 1900, Alabama, Claybank Cemetery. 7. ix. EDWARD DOWLING, b. 1820, Jeffries Creek SC; d. May 21, 1906. 6. JOHN5 DOWLING (DEMPSEY4, JOHN3, ROBERT2, FRAMPTON1) was born July 29, 1818 in Jeffries Creek, S.C., and died February 28, 1900 in Alabama, Claybank Cemetery. He married CHARLOTTE BRACKIN January 10, 1841, daughter of ISAAC BRACKIN and RACHEL STALCOP. i. SAMUEL LAWSON6 DOWLING, m. SARAH J. WINDHAM. 8. ix. 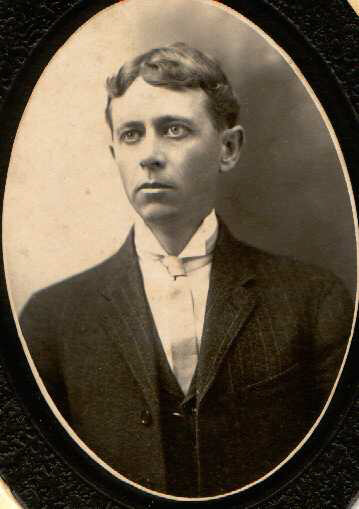 NOEL BAXTER DOWLING, b. August 15, 1853, Ozark, Alabama Dale County; d. March 28, 1915, Alabama, buried at Claybank Cemetery. 7. 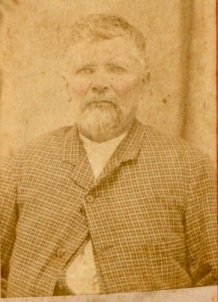 EDWARD5 DOWLING (DEMPSEY4, JOHN3, ROBERT2, FRAMPTON1) was born 1820 in Jeffries Creek SC, and died May 21, 1906. He married ANNA OATES October 24, 1841, daughter of STEPHEN OATES and ELIZABETH SHIPP. 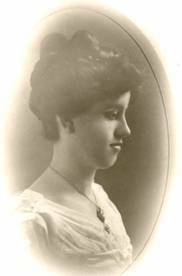 i. LIZZIE6 DOWLING, b. October 21, 1846, Ozark, Alabama; d. December 14, 1916, Nagadoches, TX. 8. NOEL BAXTER6 DOWLING (JOHN5, DEMPSEY4, JOHN3, ROBERT2, FRAMPTON1) was born August 15, 1853 in Ozark, Alabama Dale County, and died March 28, 1915 in Alabama, buried at Claybank Cemetery. He married ELIZABETH WELLS (LIZZIE E. WELLS) May 1874, daughter of EBEN WELLS and TAMSEY JOHNSON. 9. i. RAY A.7 DOWLING. 10. iii. LOTTIE BEA DOWLING. 11. iv. CORA LEE DOWLING, b. 1877, Ozark, Al Dale County; d. Dothan, Alabama, City Cemetery. 12. v. CARROW DEE DOWLING, b. June 30, 1879, Ozark, Alabama; d. August 15, 1963, Jacksonville, Florida. 9. RAY A.7 DOWLING (NOEL BAXTER6, JOHN5, DEMPSEY4, JOHN3, ROBERT2, FRAMPTON1). He married CONA ALENE YORK. 13. i. NOEL MITCHELL8 DOWLING. iii. 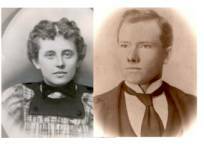 HELEN VIRGINIA DOWLING, m. (1) EARLE STAPLETON; m. (2) JOHN DRAKE. iv. LILIAN EUGENIA DOWLING, m. L. ENNIS GIBBONS. 15. v. CONA KENNETTE DOWLING. vi. RANAH ALENE DOWLING, m. FRANK M KING. 10. LOTTIE BEA7 DOWLING (NOEL BAXTER6, JOHN5, DEMPSEY4, JOHN3, ROBERT2, FRAMPTON1). She married CHARLES D. MURPHY , SR..
ii. MAUDE MURPHY, m. EWELL W. POWERS. iii. LOUISE MURPHY, m. JUDSON BENTLEY. iv. NELL MURPHY, m. E. B. MCDANIEL. 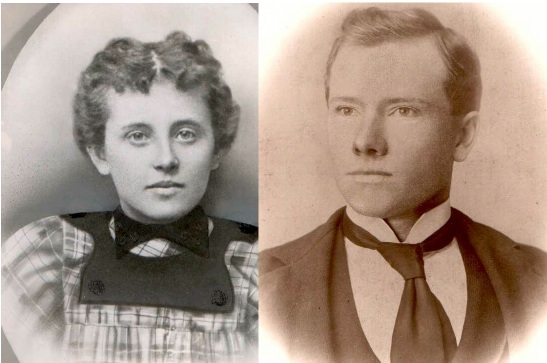 v. MARY E. MURPHY, m. JOHN B. HAZARD. 11. CORA LEE7 DOWLING (NOEL BAXTER6, JOHN5, DEMPSEY4, JOHN3, ROBERT2, FRAMPTON1) was born 1877 in Ozark, Al Dale County, and died in Dothan, Alabama, City Cemetery. She married RICHARD HAWTHORNE RAMSEY June 1966, son of DAVID RAMSEY and EMMA HAWTHORNE. 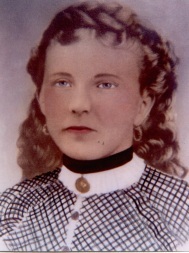 16. i. FRANCES8 RAMSEY, b. Pinckard, Alabama. ii. CASSIE RAMSEY, b. March 14, 1899, Pinckard, Alabama; d. 1995, Dothan, Alabama Houston County. 17. iii. RICHARD HAYWARD RAMSEY, b. February 26, 1901, Cottonwood, Alabama; d. November 14, 1981, Dothan, Al. City Cemetery. 18. iv. JOSEPH ROBERT RAMSEY, b. July 26, 1906, Pinckard, Alabama; d. November 1979, Dothan, Alabama Houston County. 12. CARROW DEE7 DOWLING (NOEL BAXTER6, JOHN5, DEMPSEY4, JOHN3, ROBERT2, FRAMPTON1) was born June 30, 1879 in Ozark, Alabama, and died August 15, 1963 in Jacksonville, Florida. She married CHARLES ERVIN MCCARN , JR. June 17, 1902 in Alabama. 19. i. MAVIS8 MCCARN, b. May 21, 1903. 20. ii. ELIZABETH YVONNE MCCARN, b. August 04, 1910; d. December 08, 1993, New York, New York. iii. KATHRYN MCCARN, b. August 13, 1915. 13. NOEL MITCHELL8 DOWLING (RAY A.7, NOEL BAXTER6, JOHN5, DEMPSEY4, JOHN3, ROBERT2, FRAMPTON1). He married MARGARET PEARSON. 14. R.A.8 DOWLING (RAY A.7, NOEL BAXTER6, JOHN5, DEMPSEY4, JOHN3, ROBERT2, FRAMPTON1). He married AGNES WESTERVELT. 15. CONA KENNETTE8 DOWLING (RAY A.7, NOEL BAXTER6, JOHN5, DEMPSEY4, JOHN3, ROBERT2, FRAMPTON1). She married E. MARTIN PRICE. i. ED9 PRICE, m. BETH WEATHERFORD. 16. FRANCES8 RAMSEY (CORA LEE7 DOWLING, NOEL BAXTER6, JOHN5, DEMPSEY4, JOHN3, ROBERT2, FRAMPTON1) was born in Pinckard, Alabama. She married (1) HUGH GARNER. She married (2) CLYDE FORD. 21. i. CATHERINE9 FORD, b. Dothan, Alabama Houston County. 17. RICHARD HAYWARD8 RAMSEY (CORA LEE7 DOWLING, NOEL BAXTER6, JOHN5, DEMPSEY4, JOHN3, ROBERT2, FRAMPTON1) was born February 26, 1901 in Cottonwood, Alabama, and died November 14, 1981 in Dothan, Al. City Cemetery. He married LUCILLE RADNEY June 07, 1926, daughter of LESTER RADNEY and ADA BUIE. 22. i. RICHARD HAWTHORNE9 RAMSEY, b. June 11, Dothan, Al..
23. ii. LESTER RAMSEY, b. October 29, 1928. 24. iii. JOY ROBERTA RAMSEY, b. September 25, 1939, Dothan, Al. ; d. Memphis, Tennessee. 25. iv. JON ALLAN RAMSEY, b. September 25, 1939, Dothan, Al..
18. JOSEPH ROBERT8 RAMSEY (CORA LEE7 DOWLING, NOEL BAXTER6, JOHN5, DEMPSEY4, JOHN3, ROBERT2, FRAMPTON1) was born July 26, 1906 in Pinckard, Alabama, and died November 1979 in Dothan, Alabama Houston County. He married HILDA PEARL HAWKINS May 03, 1935 in Dothan, Al., daughter of ALPHEUS HAWKINS and ALICE LINDSAY. i. JOSEPH ROBERT9 RAMSEY, b. 1938. 26. ii. PHILIP HART RAMSEY, b. April 20, 1940. 27. iii. EDWARD LAWRENCE RAMSEY, b. December 07, 1941, Dothan, Alabama Houston County. 28. iv. JOEL WARDLAW RAMSEY, b. May 03, 1947, Dothan, Houston County, Alabama. 29. v. WILLIAM ALLEN RAMSEY, b. August 15, 1948, Dothan, Alabama Houston County. 19. MAVIS8 MCCARN (CARROW DEE7 DOWLING, NOEL BAXTER6, JOHN5, DEMPSEY4, JOHN3, ROBERT2, FRAMPTON1) was born May 21, 1903. She married ERWIN T. BROOKS. i. MAVIS9 BROOKS, m. POWELL. 20. ELIZABETH YVONNE8 MCCARN (CARROW DEE7 DOWLING, NOEL BAXTER6, JOHN5, DEMPSEY4, JOHN3, ROBERT2, FRAMPTON1) was born August 04, 1910, and died December 08, 1993 in New York, New York. She married KEN TOWE. i. KENNETH MCCARN9 TOWE, b. January 31, 1935.
ii. ROLF HARVY TOWE, b. October 12, 1938.
iii. TERI NOEL TOWE, b. June 02, 1948, New York, New York. Bake potatoes for 75 minutes (or until done) in oven preheated to 350°. While the potatoes are still hot, cut them in half across the “short side”, and carefully scoop out the contents, reserving the skins to be refilled later. Mash the scooped out potato with lightly salted butter to the desired consistency. Add finely chopped scallions to taste, and one finely chopped sweet pickle. Mix well. Carefully refill the potato skins with this mixture. Place stuffed potatoes into a glass baking dish (They should be placed close together, so that they touch one another.) Cover the tops of the potatoes with grated sharp cheddar cheese, and bake again in a preheated 350° oven until the cheese is melted and golden brown. The potatoes may be made in advance and refrigerated, but it is a good idea to allow them to come up to room temperature before you bake them the second time to melt and brown the cheese. To this sautéed mixture, add dark crabmeat (approximately the amount in 4 crabs), which has been carefully picked over and all of the shell and cartilage removed. Then add two slices of white bread, which have been soaked in water and then had all of the water squeezed out of them. Blend together, then blend in ½ cup finely chopped parsley. Then blend in 2 well beaten eggs, and season the mixture with Tabasco® and black pepper, to taste. Spoon the mixture back into the crab shells, sprinkle fine, seasoned bread crumbs over the top, and then bake in a 350° oven for about 20 minutes, or until done. If you want to make crabcakes, rather than bake the mixture in crab shells or ramekins, gently mold the mixture into cakes, refrigerate until firm, roll the cakes in bread crumbs or corn meal, then fry ‘till done. Wesson® oil. Beat well after each addition. Pour into greased tube pan and bake in 300° oven for 1 hour. Remove cake from oven, but leave it pan. While still very hot, punch holes over top of cake with ice pick or tooth pick and pour this icing over it. Mix 1½ lbs. ground beef with ¼ cup of chopped onions, 1 cup of “instant” oats, I cup of tomato juice, and 1 tablespoon of Worcestershire sauce. Mix well and form into patties. In a skillet, brown the patties on both sides in butter. Remove patties from pan, and pour off all but 3 tablespoons of the cooking juices. To the 3 tablespoons of cooking juices add 3 tablespoons of flour, 1 cup of beef broth, and ½ cup of sherry. Mix and bring to a boil. Add the patties, reduce eat, and cook until done, about 15 minutes. Add 4 oz. of either fresh or drained canned mushrooms and heat through. Serve over rice. Soak 3 slices of white bread in ½ cup of beef broth. Into a blender put 1 egg, 1 small onion that has been chopped, 1 peeled clove of garlic, 1 teaspoon of paprika, ¼ teaspoon of thyme, and black pepper to taste. Add the three slices of broth soaked bread, and blend until smooth. Add this mixture to 2 lbs. of ground beef and mix well. Form the meat balls, using one level tablespoon of the mixture for each meat ball. Strain a 1 lb. can of Italian tomatoes, and put the tomatoes, 1/3 cup of brown sugar, 1/3 cup white sugar, 3 tablespoons of lemon juice, and 6 ginger snaps, into the blender and blend until smooth. Pour this mixture into a pan, add the meat balls, and cook slowly for 1 ½ hours. Pour ½ cup of cold water into a saucepan. Sprinkle in 1 package of Knox® unflavored gelatin. Add 1/3 cup of sugar and a pinch of salt. Then add the yolks of 3 eggs, and mix well. Place over very low heat, and stir until the gelatin has dissolved and the mixture has thickened somewhat. Do not boil! Stir into the mixture ¼ cup of cognac and ¼ cup of crème de cacao. Cool the mixture until it mounds slightly. Beat 3 egg whites until foamy. Slowly add 1/3 cup of sugar, and beat until like meringue. Fold the egg white mixture into the mounded egg yolk mixture; then fold in 1 cup whipped heavy cream. Pour the mixture into individual soufflé ramekins with well buttered collars. Cover with SaranWrap®, and refrigerate for at least 8 hours. Serve garnished with a dollop of whipped cream and shaved bitter chocolate. The flavoring for this cold soufflé may be varied to suit the occasion, and many other liqueurs will be found to be equally effective. Vary the garnish, other than the whipped cream, accordingly. Preheat the oven to 350°. Lightly grease a 1½ quart baking dish. Combine ½ cup of sugar and 3 tablespoons of cornstarch. Add 2 well beaten eggs, 1 1lb. can of creamed corn, and 1 13 oz. can of evaporated milk. Mix well, and pour into the baking dish. Dot liberally with butter, and bake for about 1 hour, or until center is almost firm. Cook 1 cup of grits in 1½ cups of hot water until done. When the grits are done, add 4 Tablespoons of lightly salted butter, a pinch of salt, and ½ teaspoon of sugar. Cook until the liquid is absorbed. Remove from heat, and add 2 well-beaten eggs, 1½ cups of milk, and ¾ cup of grated sharp cheddar cheese. Mix well, and pour the mixture into a well greased 2 quart casserole. Top with more grated cheese, and bake in a preheated 350° oven for 30 minutes. Unidentified photo found in Cassie Ramsey’s collection...Help!!! Cook 1 8 oz. package of macaroni according to the directions on the package. Drain. Combine the cooked macaroni with 2 cups of cream style cottage cheese, 1 8 oz. carton of sour cream, 1 slightly beaten egg, a dash of cayenne pepper, and 2 cups (8 oz.) grated sharp cheese. In a covered, heavy roasting pan, place a 12 to 16 lb. beef tenderloin that has been sprinkled liberally with pepper and garlic salt. Make a marinade from 1 16 oz. bottle of olive oil, 1 16 oz. bottle of red wine vinegar, 3 cups of burgundy, and 3 garlic cloves. Marinate in the refrigerator overnight. In a saucepan, heat 2 oz. of bitter chocolate and 1 cup of heavy cream very slowly, stirring regularly, to melt the chocolate and blend it into the cream. Do not boil. Remove from heat, and let the mixture cool slightly, while you are beating 3 egg yolks until lemon colored. Add 2 tablespoons of sugar to the egg yolks while beating them very slowly. Stir the warm chocolate mixture into the egg mixture, and then blend in 2 teaspoons of vanilla. Strain into ceramic “pot de crème” pots, and set the pots in a baking pan in which there is 1 inch of hot water. Cover with foil, and bake at 325° for 15 minutes. Cool and then chill, after testing for doneness. Cook 1 10 oz. package of frozen spinach and drain well. Transfer the cooked spinach to a large bowl; then stir in 1 cup cooked rice, 1 cup grated American cheese, 2 slightly beaten eggs, 2 tablespoons softened butter, 1/3 cup of milk, 2 tablespoons chopped onions, ½ teaspoon of Worcestershire, and ¼ teaspoon of thyme. Blend together and spoon into a greased 10 x 16 x 1½ baking dish. Bake in a 350° oven for 20 to 25 minutes. Cut out in squares. Cream ½ cup butter. 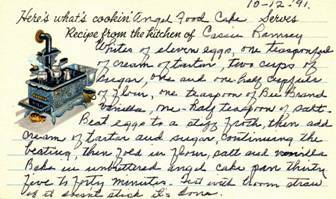 Add 6 tablespoons of dark brown sugar, 6 tablespoons of granulated white sugar, 1 well beaten egg, and ½ teaspoon vanilla. Mix well. Add 1 cup plus 2 tablespoons of flour, ½ teaspoon salt, ½ teaspoon baking soda, and 1 cup coconut, chocolate chips, or chopped nuts, and blend well. Drop small amounts of the dough, each about the size of a walnut, onto a greased cookie sheet, far enough apart to allow the dough to spread without the cookies touching each other. Bake at 375° degrees for 8 to 10 minutes. These may be made as “plain” sugar cookies, without any additions, if you prefer. Cream butter and sugar together, then add the beaten eggs, the cocoa, the flour, and the vanilla. Add coconut to taste to the batter. Mix well. Drop small amounts of the dough, each about the size of a walnut, onto the greased cooke sheet, far enough apart to allow the dough to spread without the cookies touching each other. Sprinkle more coconut on top of each cookie as a garnish, if you like. Bake at 375° approximately 8 to 10 minutes. Preheat oven to 375°. Mix together thoroughly ½ cup brown sugar, ¼ cup shortening, and 1 egg. Sift together 1½ cup all purpose flour and 2 teaspoons “double action” baking powder, then stir this mixture into the sugar, shortening, and egg mixture. Next, stir in ½ cup seedless raisins. Spread this batter into a 9 inch, 1¾ inch deep baking dish that has been greased and floured. Sprinkle the top with a mixture of 1 teaspoon cinnamon, 2 teaspoons sugar, 2 teaspoons breadcrumbs, 2 teaspoons brown sugar, and a little apple juice or melted butter to bind it together. Bake for 25 minutes to 35 minutes. In a large bowl blend one cup fine corn meal and 1 tablespoon melted butter. Add all at once 1½ cup boiling water, and beat well. In a large cup, beat two eggs well with a fork. Add 2 tablespoons of baking powder and 1 cup of milk, and then mix until foamy. Add this to the corn meal mixture and blend well. Pour this mixture into a buttered casserole dish and bake in an oven preheated to 400° for 40 minutes.